We were so hungry on the way home that we stopped off for a quick bite at PPQ, which is just down the block from us and always packed. Since it is always so busy, we assumed that it would be very good. 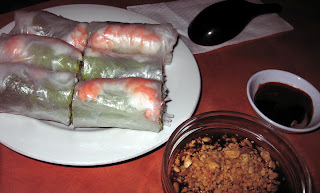 It was good, however, there are plenty of Vietnamese places within a 5 block radius that are better. 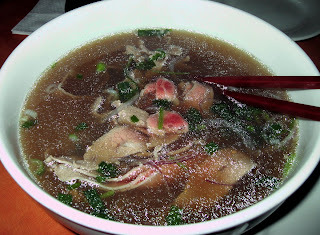 The meat was good, but the broth was not full flavored. Their sauce was too sweet with not enough savory depth. This salad was simply dressed with balsamic vinegar and salt. There really is something to be said for letting the true flavor of these organic, farm-fresh tomatoes shine through. This is a recipe I learned from our friend, F. My version was not exactly the same as his, but it was tasty. 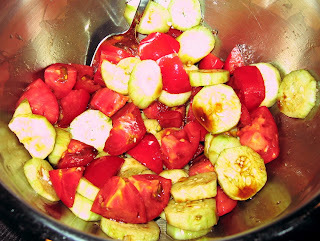 Mix together all the ingredients in the meat mixture and set aside. Cut the eggplant in coin shapes, alternating 1 cut all the way through the eggplant with 1 cut about 90% through the eggplant. This will leave you with little "coins" about 1/4 inch thick that open like a book. Fill the middle of the coins with the meat mixture to create a sandwich. 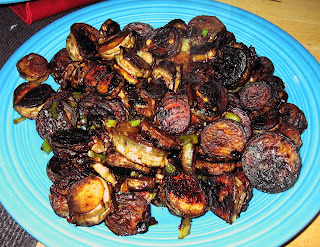 Fry the meat filled coins in a single layer on both sides until browned. Fry in batches. Set aside. Add all of the fried coins back into the pan. Mix all of the sauce ingredients and pour over the coins. Cover and steam in the sauce for a few minutes. Serve. 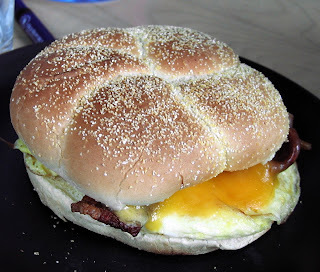 This was our rendition of an East Coast deli (or breakfast truck) classic. On a toasted Kaiser roll, it was just as we remembered from our pasts, only a little less greasy. After watching (and betting on) some horse races on the last weekend of Bay Meadows, we headed to Straits for some Indonesian/Singaporean food. Really, it's all about the roti prata, however. The service was off tonight. They were slow to bring us menus, slow to take our order, slow to bring food. Also, in the entire restaurant, which is very large, they did not have enough high chairs to bring for our friend's kids. 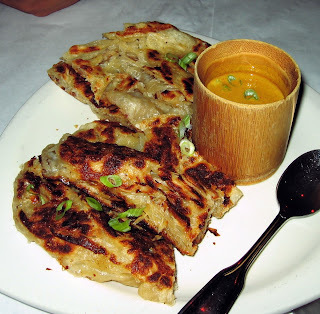 In the past we have said that the roti pata at Straits is a bit too thick, but today it was very good. And really, roti prata is never bad. 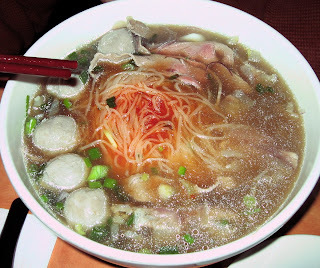 This is comfort food for Singaporeans, and it was for me to tonight for some reason. 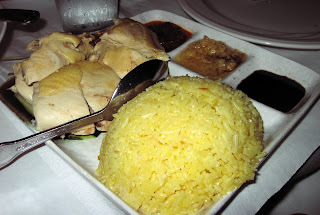 This is nowhere near the most exciting dish, but there is something oddly satisfying about boiled chicken, rice, and condiments. 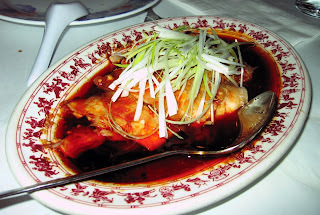 We stopped off at Little Szechuan on our way to Bay Meadows for a quick, and very spicy, meal. I'm not sure how much each dish was individually, but I think the meal was around $20 total. This tendon is sliced so thin that even I like it. Somehow, when sliced thin, the super-gelatinous, chewy texture, seems to fade away. The sauce was very tasty too. Although we ordered these noodles with chicken, they came with pork. The waiter did not apologize, but simply told us that he put the wrong order in and then plunked the dish on the table. 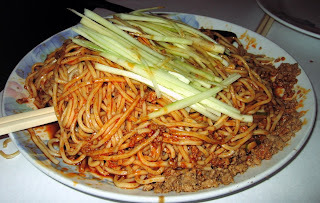 In any case, these spicy noodles were quite tasty and the julienne of cucumber was provided a welcome, cooling effect. 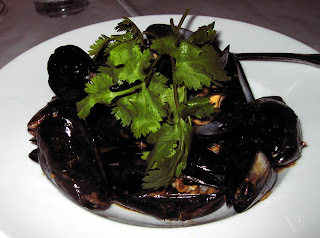 These were so spicy and so delicious. The shrimp were super crispy on the outside, with a very light batter. 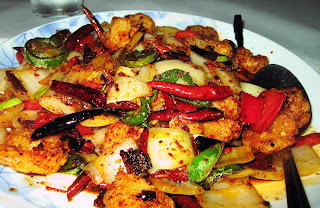 And the szechuan peppercorn left our mouths numb rather than on fire, which is preferable.